Israeli medium-range missile defense system wins prestigious award at Multinational Ballistic Missile Defense Conference in Boston. 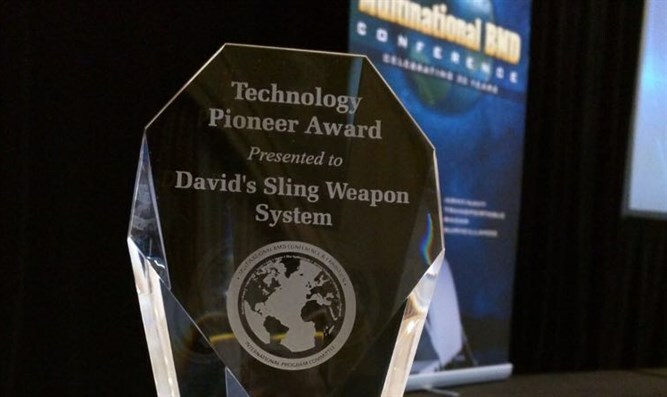 On Tuesday, the David’s Sling Weapons System (DSWS) was awarded the prestigious Technology Pioneer Award at the 2017 Multinational Ballistic Missile Defense (BMD) Conference in Boston, Massachusetts, in recognition of ground-breaking achievements in Lower-Tier Ballistic Missile and Cruise Missile Defense. With a robust system-of-systems architecture and breakthrough Stunner Interceptor technologies, David's Sling attains cutting-edge performance in protection against endo-atmospheric threats on a national scale. The Technology Pioneer Award is presented each year by the Multinational BMD Conference’s International Program Committee in recognition of significant technical achievement in the field of missile defense. This is the 30th year of the Multinational Ballistic Missile Defense Conference, demonstrating a commitment to expanding missile defense capabilities and knowledge. The conference has a wide global community with increasing participation from Europe, Asia Pacific and Middle East. IMDO Director Mr. Moshe Patel received the award on behalf of the state of Israel. "The marvelous capabilities of the David Sling Defense System are a significant breakthrough in the world of interception technology. The unique characteristics of the system interceptors are astounding in every test that is done. The DSWS is an important component of Israel’s operational capability to defend the country against regional missile threats. I would like to thank to our American partners on the recognition of the ‘DSWS’ and the message it brings along." Pini Yungman, Executive Vice President and Head of Rafael's Air Superiority Systems Division said, "Awarding David's Sling this prize is another testimony to the technological breakthrough that it represents, and its great achievement after years of development and finding creative, unique solutions from all of Rafael's engineers and other industry partners. David's Sling is the result of close, successful cooperation between Rafael, the project's lead developer, and America's Raytheon, who is a partner in the program. David's Sling is one of the world's most advanced missile defense systems, and, alongside Iron Dome and the Arrow systems, it's an additional layer of defense to the State of Israel." David's Sling is a joint bi-national effort of the United States Missile Defense Agency and the Israel Missile Defense Organization (IMDO), of the Directorate of Defense Research and Development at Israel's Ministry of Defense. The prime contractor for the David’s Sling Weapon System Program is Rafael Advanced Defense Systems, with Raytheon Missile Systems as a sub-contractor. The Multi Mission Radar is developed by Elta, a subsidiary of Israel Aerospace Industries and the Battle Management Command, known as the Golden Almond, is developed by Elisra, an Elbit subsidiary.